There’s only one GRANDDADDY PURPLE original and this is it! There are lots of imitators out there today, but this propriety "Royal Indica" strain whose puffy buds are unusually dense, magnificent in their unreal color scheme, their unmistakable smell, awesome taste and unbelievable potency are what make it, straight up uniquely… the "Real Deal"! Our special Diesel selection. Very strong smell and high. This strain is easy to grow and many of the plants have purple colors threw the buds. This pure Indica strain is one of the prettiest auto-flowering strains that you can grow. It has a very intense, passionate purple color with orange hairs, creating a beautiful contrast as well as a unique smell and great taste and potency. It is known for its highly relaxing indica effect on both mind and body, without being overpowering. Purple Kush Auto is a cross between the original Purple Kush and an unknown ruderalis strain. Because the original Purple Kush is a mix of both Purple Afghani and Hindu Kush then this auto-flowering variety has a lot of indica dominant characteristics with bushy branches, dense buds and shorter than average height. Purple Kush Auto carries a sweet, herbal scent and flavour that is typical of Kush strains, as well as a long-lasting euphoria. This strain, high in THC (15-20%) and low in CBD, is especially useful in treating pain flare-ups, insomnia, and anxiety. Auto Purple Kush is a strain that requires little attention and is suitable for both outdoor and indoor grows. The perfect strain if you want a quick, low-maintenance source of relaxation and a vibrant jewel for your garden! Compact in size with a short growing cycle makes Purple Kush an ideal strain for the impatient grower. Purple Kush, a pure indica variety from Oakland, California, is world-renowned for its purple leaves and strong smoky taste combined with a very high THC level. This strain is the result of a cross between the insanely popular Hindu Kush and Purple Afghani varieties. The Purple Kush plant is short in stature with dense buds riddled with thin white and orange hairs. Purple Kush is a durable and versatile plant with frosty buds and an earthy pungent aroma. 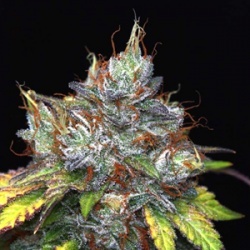 Quebec Cannabis Seeds find that this Purple Kush weed has a heavy high with a strong body stone and a hit lasting for two to three hours resulting in relieving the mind while relaxing the body from physical pain, insomnia, and stress. The smoke has a somewhat fruity flavor reminiscent of grapes and an earthy, skunk-like aftertaste. Purple Kush flowers within 8 to 10 weeks and it can provide you with a high yield of frosty buds. This strain was named one of the Top 10 Most Powerful Strains in the World by High Times magazine as is THC level is extremely high (up to 23.51%) and the effect is a known pure indica feeling that will make you come back for more. Due to its potent effects, Purple Kush is said to be an ideal strain for treating patients suffering from conditions such as insomnia, chronic pain, nerve damage, and muscle spasms.